The Captain and Me is the third studio album by American rock band The Doobie Brothers. The album was released on March 2, 1973, by Warner Bros. Records. It features some of their most popular hits including "Long Train Runnin'", "China Grove" and "Without You". The album is certified 2x Platinum by the RIAA. There was pressure on the band to move quickly and to save time they began reworking old tunes. One of Tom Johnston's songs, "Osborn", had been an improvisational piece that the band played live. After laying down the track, according to producer Ted Templeman, "We still really didn't have it, and I said, 'Make it about a train, since you have this thing about 'Miss Lucy down along the track.' So he came up with "Long Train Runnin'." Patrick Simmons' short solo guitar piece "Busted Down Around O'Connelley Corners" segues into "Ukiah", which Johnston wrote in tribute to the area. Johnston said, "We played a few shows in Ukiah, and I used to camp out a lot in the area when I was going to college." The song's back-to-the-land sentiments also reflected some of his feelings at the time, although he admitted he probably couldn't make it as a farmer. This track segues into the album closer and title track, "The Captain and Me". According to Johnston, the captain is no one in particular and the lyrics were written at the last minute and have no real meaning. The song was released as a single in the Netherlands and received some airplay there. The album was originally released in Quadraphonic sound on the CD-4 Quadradisc system and also on Quadraphonic 8-track tape. The album was also released in 2002 remixed into 5.1 multichannel DVD-Audio, and on 14 September 2011, on hybrid stereo-multichannel Super Audio CD by Warner Japan in their Warner Premium Sound series. 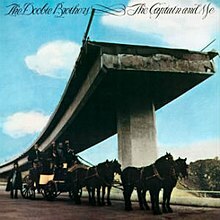 The artwork found on the front and back of the album features the band, including manager Bruce Cohn, dressed in 19th century western garments and riding a horse-drawn stagecoach beneath an unfinished modern freeway overpass. "All that stuff came from the Warner Bros. film studios lot," Tom Johnston said. "It must've been a lot of work for the guys who brought up the horse team and the carriage and the clothes. It was fun to do - they had coffins out there, all kinds of crazy stuff." The photography was done by Michael and Jill Maggid. The setting for the cover was located at the Newhall Pass interchange of the Interstate 5 and California State Route 14 freeways near Sylmar, California that collapsed during the 1971 San Fernando earthquake. This same section of freeway would collapse again during the 1994 Northridge earthquake. ^ Bruce Eder. "The Captain and Me - The Doobie Brothers". AllMusic. Retrieved 2018-08-20. ^ Paul Rigby. "The Captain & Me - Record Collector Magazine". Record Collector. Retrieved 2019-02-04. ^ Bud Scoppa (1973-05-10). "The Doobie Brothers: The Captain & Me". Rolling Stone. Retrieved 2018-08-20. ^ a b c d "Old Black Water Keep on Rollin': 30 Years of the Doobie Brothers". Long Train Runnin': The Doobie Brothers 1970–2000 (CD Booklet). The Doobie Brothers. Warner Bros. Records. 1999. p. 20. 75876. ^ (in Japanese) Warner Premium Sound 14 September releases Archived 2011-08-13 at the Wayback Machine. Retrieved 2011-11-03. This page was last edited on 5 February 2019, at 00:42 (UTC).